The folks at Bon Appetit have declared Kraft Original to be the best store-bought BBQ sauce (out of eleven tested). Stubb's and KC Masterpiece took second and third. I have to respectfully disagree with their assessment of Kraft, even though they followed Grillmaster Steven Raichlen's advice for the blind taste test. 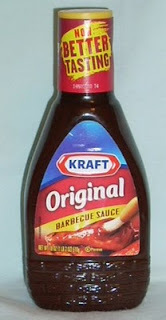 TCB wholeheartedly prefers Kraft's premium BBQ sauce line...Bull's-Eye...to their namesake brand.